Joe asks, via Twitter, "what causes traffic?" This is exactly the kind of general interest, political question that this blog was made to answer. Basically, the answer is an issue of low supply and high demand. Roads are generally cited as an example of "public goods," but this is a mistake. A public good is one that is both non-rivalrous (rivalrous meaning, if Joe uses it I can't, like a burrito) and non-excludable (excludable meaning you can keep people out based on some characteristic; it could be a characteristic they have control over, like deciding to pay or not--a theme park--or one they can't control--think Augusta golf club or a "whites only" water fountain in the 1950's American south). Now without getting too wrapped up in definitions and examples, it should be obvious that roads are neither non-rivalrous nor non-excludable. 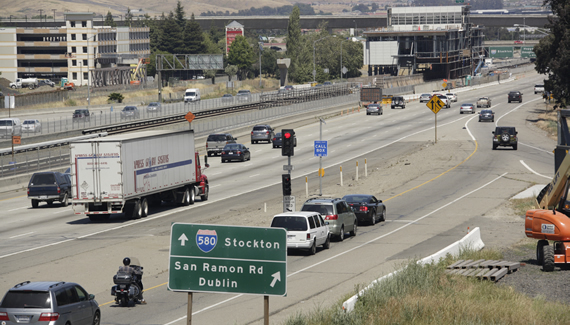 The 100 or so square feet that Joe's truck takes up on the 580 can't be occupied by any other vehicle while he is using it (thus, rivalrous) and there are many ways of excluding vehicles from using the roads, by requiring them to have registrations, inspections, etc. What does showing that roads are private goods have to do with traffic? Well, it suggests that market-based allocation of road space would be more efficient. You may be thinking of tollways and retorting that the Bay Bridge has a toll and is often crowded. Yes but as far as I know--correct me if I'm wrong--it's a flat rate. Joe's question was prompted by the fact that demand for road space fluctuates over time. Market pricing would make high-traffic times more expensive, and would cause people who are unwilling to pay to use alternate routes. This is the same principle that makes evergreen trees more expensive in late November/December and roses cost more on Valentine's day, although I wouldn't recommend substituting daisies. If this theory is correct, traffic would become less of a problem if it were priced according to supply and demand. Unfortunately, no one has been willing to really try it. The closest thing I've seen is the I-10 HOV lanes from Houston to Katy: individual drivers have the option to purchase the use of that lane at prices that increase at high traffic times--when they are most desirable. I have yet to see those lanes moving slowly.